The Hampshire-based coach company appeared in this week’s episode, which focused on country pub The Crown in Aldbourne. The show sees hotel guru Alex Polizzi work with a different hotel or B&B every week and try to help them improve their bookings and ultimately their profits. This week’s episode saw Alex lend her expertise to Alan, the owner of The Crown Inn in Aldbourne and, after some big improvements, Lucketts was called in to test out the turned-around venue. 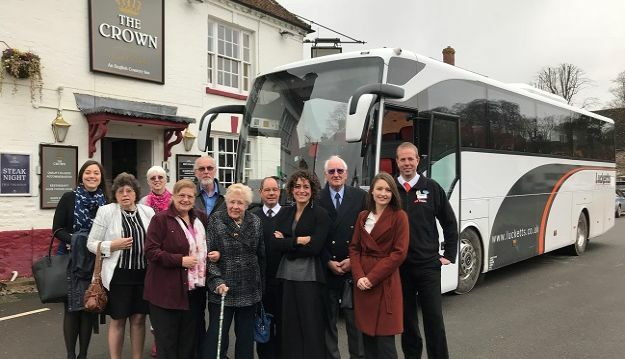 In the show group marketing manager Laura Bainbridge went along to the country pub with a coach full of Lucketts customers to trial its improved lunch offering. As Lucketts runs around 400 day trips every year, it was important for Alan and his team to impress the company in the hope of winning some return custom.